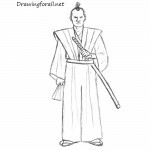 Hello, dear young artists, and welcome to Drawingforall.net. Who are the Knights? The brave medieval warriors clad in metal armor, who fought with each other, as in the war of the roses. 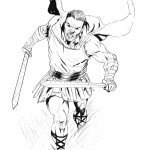 Now they are heroes of fantasy, who fight with orcs, goblins, and minotaurs. 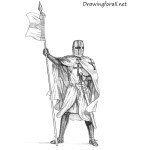 Let’s start the drawing lesson and learn how to draw a knight for beginners! 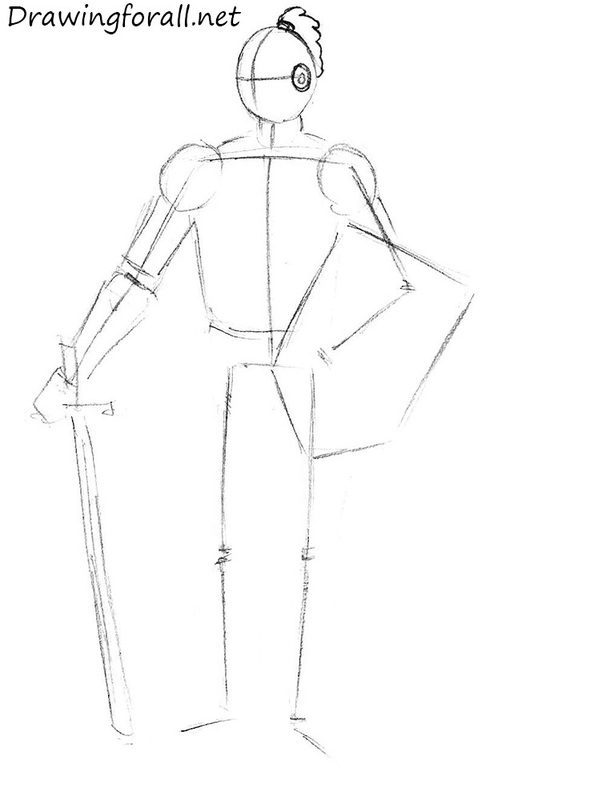 At first we need to draw the skeleton of the knight. Using a circle sketch out the head. Sketch out the body using light and loose lines. 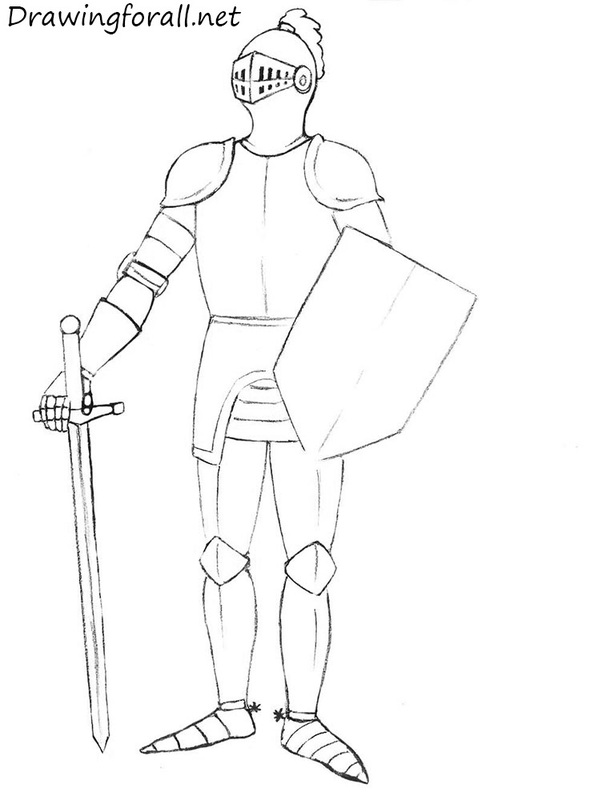 In this drawing the knight stands with shield and sword. But you can choose any other pose. Torso height is equal of two head heights. The height of the legs are equal to height of torso. Sketch out the lines of the facial symmetry. The lines should be crossed in the center of the face. 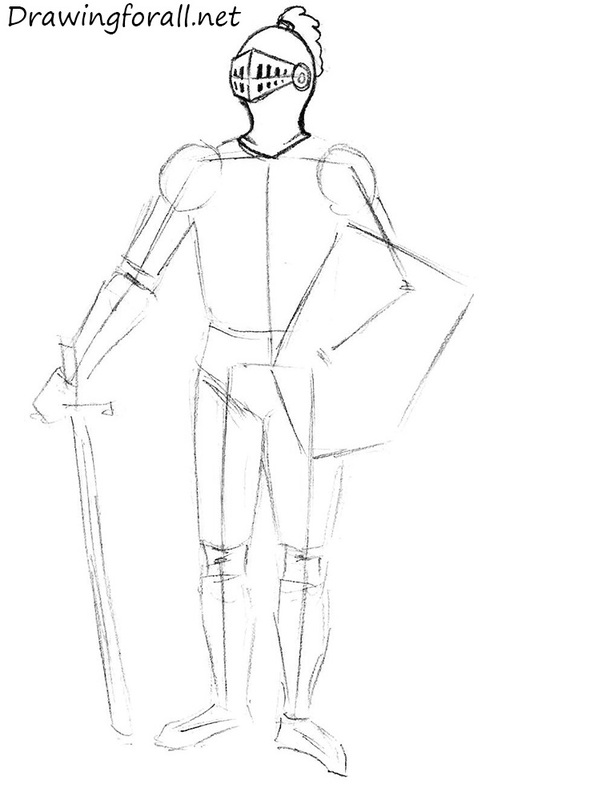 Sketch out the outlines of the shield and sword. Using wavy line draw the tuft on the helmet. Using cylinder draw the neck. Outline the shoulders using circles. 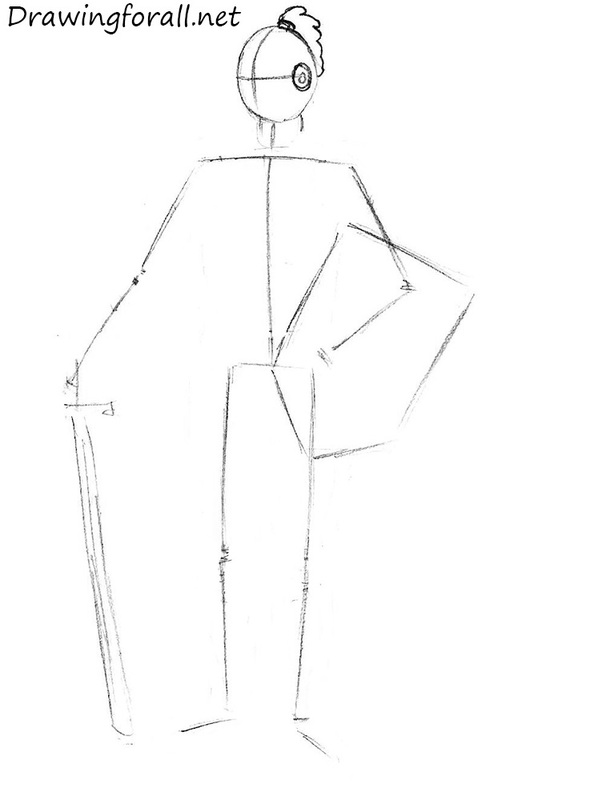 Sketch out torso in a form of a rectangle. Sketch out the visible arm, which consists of two equal cylinders. Draw the triangular pelvis as in our example. Sketch out the legs, each of which consist of two equal cylinders. 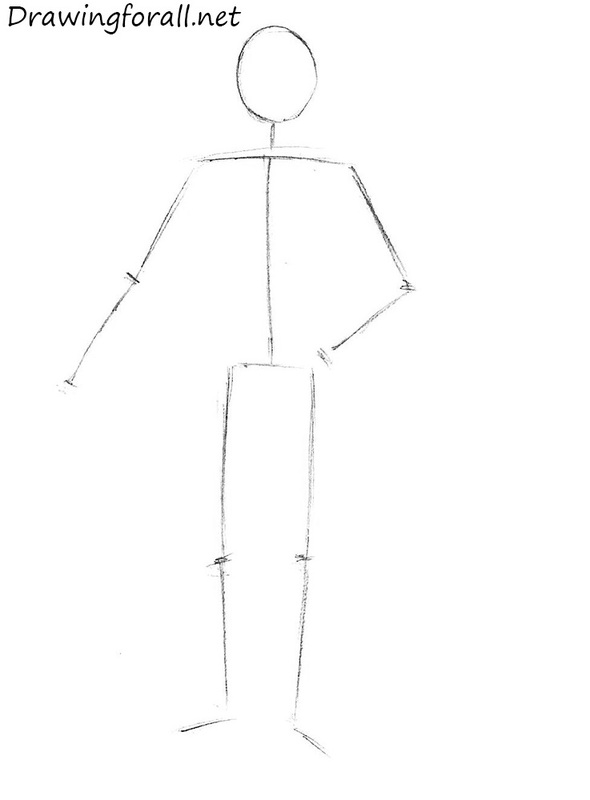 Draw the feet as in the example below. Draw the visor, it is the part of the helmet with openings for eyes. Draw the line of the neck with curved lines. Erase the unnecessary guidelines and extra strokes. Smoothen and darken the lines. 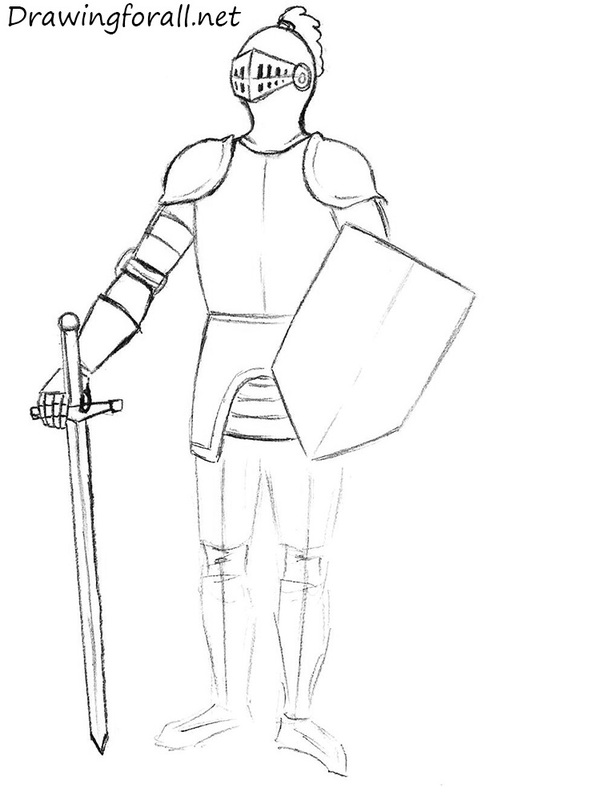 Draw the shoulder protectors (gardbraces) as in our example. Erase the guidelines from the torso. 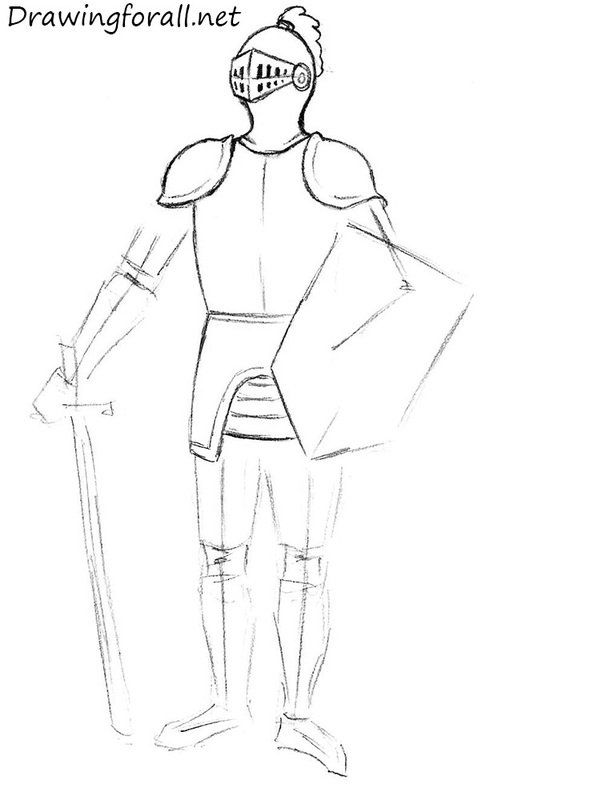 Draw the breastplate and tasset (the part of the armor, which protects the pelvis). Erase the guidelines from the arms. Draw the details of the arm protectors. Circle the lines to make them smooth and clean. 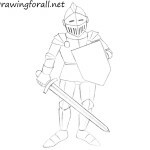 Draw the sword using straight lines. Try to draw these lines without a ruler. It was the drawing lesson about how to draw a knight for beginners. We hope you liked this drawing lesson. 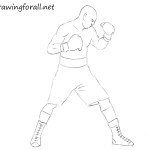 If you like this drawing lesson, subscribe to our updates in Google Plus.